Defend & Advance is a temporary exhibit of 39 original artworks by 17 artists that celebrates the establishment of the National Immigration Law Center’s permanent art collection. With broadly varied approaches and narratives, the artists in this exhibition explore current conditions of immigration and migration, displacement and labor, and struggle against collective amnesia. The artists are from a diverse range of geographic, political and social backgrounds. Considering their work in dialogue allows us not only to reflect on their differences but also to consider their shared concerns. The exhibit offers new perspectives on issues we may have previously thought familiar. The curation seeks to discover shared experiences that can be explored in conversation and used to promote intellectual and emotional engagement with the subjects being presented. Artists: Anna Stump, Arturo Cambron, Cintia Segovia, Diane Williams, Dohnbi Kim & Oshri Hakak, Hyunji Lee, Joseph Muchina Mwangi, Jose Ramirez, Kuniko Ruch, Lori Dorn, Mahsan Ghazianzad, Michael Fischerkeller, Miggie Wong, Mona Nicole Sfeir, Narsiso C. Martinez, Paige Emery, Xilomen Rios. Established in 1979, the National Immigration Law Center (NILC) is one of the leading organizations in the U.S. exclusively dedicated to defending and advancing the rights of low-income immigrants. NILC believes that all people who live in the U.S.—regardless of their race, gender, immigration and/or economic status—should have the opportunity to achieve their full potential. Over the years NILC has been at the forefront of many of the country’s greatest challenges when it comes to immigration issues, and plays a major leadership role in addressing the real-life impact of polices that affect the ability of low-income immigrants to prosper and thrive. Renae Barnard is a multidisciplinary artist and curator. She holds a Master of Fine Arts degree from Claremont Graduate University. Barnard’s work has been shown at Shoshana Wayne Gallery, Harriet & Charles Luckman Gallery, Berkeley Art Center, Los Angeles Municipal Gallery and SOMArts Gallery. Recent curatorial projects include From Her, El Pueblo de Los Angeles Historical Monument. (March 2015). Almost Home, Claremont City Hall. (March 2015). Pathway Analysis, Claremont City Hall. (October 2014). Home Makers? Underground Tunnel, Los Angeles, CA (July 2014). Hamartia, Claremont City Hall. (April 2014). Barnard has been the recipient of the Armory Center for the Arts Teaching Artist Fellowship, Ahmanson Annual Fellowship, Christopher Street West Art & Culture Grant and the Lincoln Fellowship Award. Claremont, CA –Claremont Graduate University presents Temporary Shelter: MFA Thesis Exhibition of Artist Renae Barnard, a solo exhibition of sculpture and installation. Many of Barnard’s sculptures are worked within inches of collapse. The meticulously folded, twisted and sewn objects are both destroyed by and reinforced with the repetitive gestures by which they are made. Renae Barnard is a multidisciplinary artist living and working in Los Angeles. Barnard’s work has been shown at Shoshana Wayne Gallery, Harriet & Charles Luckman Gallery, Annenberg Community Beach House Gallery, Berkeley Art Center, SOMArts Gallery, Pete & Susan Barrett Gallery, Grace Albrecht Gallery, Los Angeles Municipal Gallery, Peggy Phelps Gallery as well as screened at U.S. and international film festivals. Barnard has been the recipient of many awards including but not limited to Outstanding Experimental Film, Sue Arlen Walker and Harvey M. Parker Memorial Fellowship, Armory Center for the Arts Teaching Artist Fellowship, Ahmanson Annual Fellowship, Christopher Street West Art & Culture Grant, Lincoln Fellowship Award and the Pasadena Arts Council Fiscal Sponsorship. Barnard has spoken about her work at the Open Engagement Conference at the Queens Museum, NY, The Long Beach LGTBQ Film Festival, Shoshana Wayne Gallery and Los Angeles Municipal Gallery. Free art exhibit to take place at City Hall from March 23rd 2015 – September 11th 2015. Almost Home presents fourteen works by ten emerging artists currently enrolled in Claremont Graduate University’s MFA Program. This exhibition continues a long tradition of highlighting MFA candidates in the galleries of Claremont City Hall. Almost Home was curated by Renae Barnard and Jonathan Elder. It will be on display from March 23rd 2015 – September 11th 2015. Almost Home celebrates the process of exploration and recognizes the intricacies involved in the movement from the conceptual to the physical. These experimental practices and open-ended methods of discovery allow viewers the opportunity to engage with a broad range of materials and artistic approaches. Abstract paintings by Hazzar Samman, Devin Johnson, Lara Salmon, Jonathan Elder, Lei Shen, Elizabeth Hoffman, Hessah Alajaji, Lana Duong and Alana Medina are in quiet conversation with representational works by Raheem Fadul and Yehsiming Jue. Monday –Friday 7:00 a.m. to 6:00 p.m. Opening Reception April 28th 6-8pm. Free art exhibit to take place at City Hall from October 20th, 2014- February 9th, 2015. Pathway Analysis presents eighteen works by fourteen emerging artists currently enrolled in Claremont Graduate University’s MFA Program. This exhibition continues a long tradition of highlighting MFA candidates in the galleries of Claremont City Hall. Pathway Analysis was curated by Renae Barnard and Jonathan Elder. It will be on display from October 20th, 2014 to February 9th, 2015. Pathway Analysis celebrates the process of exploration and recognizes the intricacies involved in the movement from the conceptual to the physical. These experimental practices and open-ended methods of discovery allow viewers the opportunity to engage with a broad range of materials and artistic approaches. Abstract paintings by Jonathan Elder, Yirmi Ding, Yun Lung, Chas Schroeder and Stacy Wendt are in quiet conversation with figurative works by Dena Alswaidan, Cindy Gracia, Antoine Leonard and Lara Salmon. Artists Iain Muirhead, Alice Perreault and Lilli Zhong combine traditional painting techniques with applied collage methods to create multi-faceted dimensional works, while Renae Barnard and Fang Li fashion sculptural objects from textile fibers imbued with references to the feminine and the domestic. Shoshana Wayne Gallery is pleased to present In-Situ, a summer group exhibition by emerging Los Angeles artists never before shown at the gallery. Working in a variety of mediums, the selected works by Renae Barnard, Vera Bauluz, Tofer Chin, Abdul Mazid, and Patch Wright offer an invitation to think about the relationship between place and identity and the ways in which the artists' hand and materials of choice are inextricably linked to critique. Here, each artist either re-purposes, re-articulates, or re-imagines a given material and imbues it with new life and new meaning. 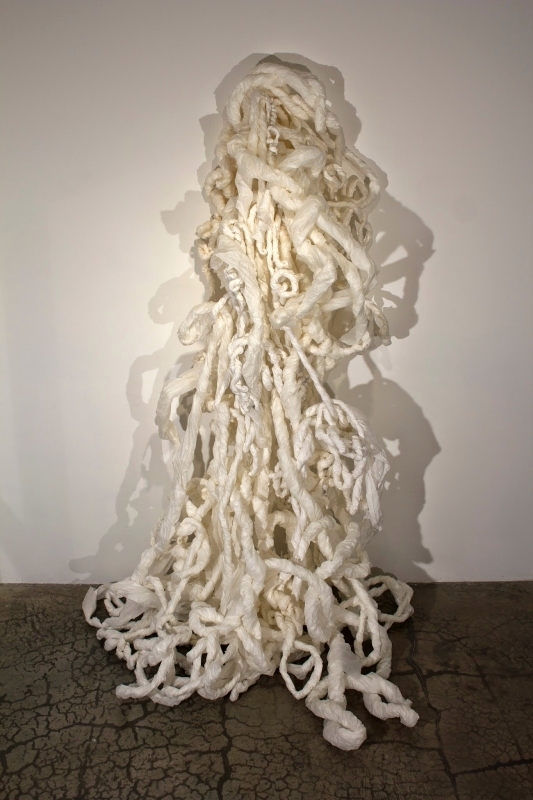 Renae Barnard creates soft sculpture from paper, thread, and ribbon, materials and tactility typically associated with women and ascribed little consequence in the world. Each of Barnard’s sculptures with their intricate twists, coils, folds, splits, and tears challenges the viewer to see beyond traditional and conventional modes of identity representation. Vera Bauluz presents found objects (janitor’s mops, brooms, and shoes) that alone have little meaning to the world aside from signifying another’s undesirable labor. Bauluz covers these heavily coded objects with gold leaf and at once blurs the distinction between the mundane and the worthless with that of beauty and value. Tofer Chin explores the relationship between architecture and the natural world, illuminating ease and delicacy in the angular and rigid with his paintings and sculptures. As part of an ongoing series, Chin’s re-imagined stalagmites symbolize living and breathing beings in an environment. They command attention while at the same time blending into their surroundings alluding to the contentious relationship between human and nature. Abdul Mazid is a multi-disciplinary conceptual artist who selects materials already imbued with heavy symbolism (sports collectibles, glitter, razor wire, Middle Eastern rugs, etc) and re-works them until they have a specified social and political meaning. For Mazid, born to a Syrian father and Mexican mother in California, identity and place inform much of his work. Mazid’s singular coupling of mediums and ideas reflects his own experience of hybridity. Patch Wright works in the realm of the uncanny creating objects that are simultaneously familiar and other worldly. The chasm between the viewer’s perception/experience and the artist’s work is precisely the space from which Wright finds strength. Demonstrating mastery over his materials, Wright pushes up against all conditions of possibility morphing the grotesque into the beautiful and the minute into the colossal. Los Angeles (May 1, 2014) Presenting more than 75 works by 22 female artists, HOME MAKERS? is the first Los Angeles exhibition to highlight women makers in a setting free from the hierarchies that segregate fine arts and craft. Curated by Renae Barnard, this exhibition connects women artists from diverse communities directly with visitors for one night only, Saturday July 12 from 6:00pm-10:00pm. Operating outside the traditional art market, the exhibition will take place in an underground tunnel in East Los Angeles and provide 100% of sales directly to the participating artists. The tunnel walls will feature photography by Leila May, Maria Garcia-Clark and Cathleen Parra, paintings by Alice Maldonado, Elwing Gonzales, and Nicole Reyes, illustrations by Cheryl Angel and Olivia Healy-Mirkovich, and sculptural fiber works by Renae Barnard, Fang Li, Jacqueline Meyers-Cho, Kin Chen and Vanessa Fry. The above ground intersection will be temporarily closed to traffic allowing for installation artists Diana Madriaga, Debbie Carlson, Jaklin Romine and Olga Lah to literally take over the street. Ceramicists Sharon Hardy and Sarah Hagen will be hosting vignettes of their work above ground alongside fiber artist Cara Mullinary, Julie Roth and Julie Kornblum and sculptors/ jewelry designers Terina Nicole and Robin Little. Master of Ceremonies Rebekkah Waites will be spinning tunes all evening and introducing a special performance by Jessica Ceballos at 7:30pm. Street parking on Figueroa. Loreto Street closed to traffic. Home Makers? An exhibition in cooperation with the Cypress Village Art Walk. Located in an underground tunnel and the surrounding intersection of Figueroa and Loreto Streets in Los Angeles. Most people think of home as a building or structure. Some call a city or a country home, while others struggle with homelessness and/or ultimately resolve that home is merely a feeling. What defines a homemaker and how does our understanding of this role impact gender norms? Visual Artists and Performers will investigate these themes. A roster of included artists and performers is coming soon! Stay tuned! The primary sponsors are Antigua Coffee House and Fine Art Solutions. The event is being curated by Renae Barnard.